Katalin Nimmerfroh, or Kate, is one of the designers and artists behind the game [redacted]. She’s originally from Hungary and now lives in London. She’s charming and talented and does a much better job illustrating these points herself, so without further ado, I give you her interview. Which came first: art or board games? Well, if you count the stick figures I drew in nursery school, it was definitely art. 🙂 If you don’t, it is probably still art, as visual arts played a great part in my life before I even realised that there’s more to board games than Hotel or Catan. How long have you been doing art? Like I said, if you count the stick figures… But I think the term “art” is a bit too generic here. I don’t just draw. I play music. I used to make short films. I even consider video games to be a form of art. In terms of illustration, I drew my first anime character when I was about 9 years old. That was a defining moment. Until then, I was only doodling, but once I finished that drawing, I decided that I’m gonna make my own comic book. I had a few hard cover notebooks that were supposed to be diaries – that was the thing back then, all girls had to have a few of those to be cool (that, and sticker albums). I used those books to draw my comics. Of course, the story was really bad, the drawings were ridiculous, and it was full of spelling errors 🙂 But it was my own. About 10 years after my first attempt of making a comic book, I started a web comic. It is still out there, but I haven’t been updating it for years. It’s always been an on-again-off-again relationship with art. I never considered being a full-time artist, but it always has been my hobby which I spent a lot of time with. How long have you been involved in board games? Easy! Since the Battlestar Galactica base game came out. That was the first board game that really got to me. We played Catan and Munchkin before with friends, but BSG was like…whooaaa! With a group of friends, we played that game so many times that the main board tore in half after a while – and not because we didn’t take care of it. We bought all the expansions, David and I made our own unofficial expansion (graphic design by yours truly, of course). Then we went to Essen, came back with 14 new games (which was a lot, considering that our whole collection was about 2 games plus expansions beforehand), and there was no stopping from there. How’d you get involved with designing [redacted]? There are several people on both the design and illustration side of [redacted]. How is it sharing those processes with people? With the illustrations, there isn’t much overlap between our jobs. Mico draws his things, I draw mine and then Todd glues it all together. The hardest part of it is that the others (David, Mityu, and of course Iraklis) have to approve of the images. Sometimes they have specific pictures in their minds, which they would like to see on the board/cards. But, you know, it is not always easy to explain these things to another person. Sometimes it feels like you have to be a mind reader to understand what they want to see. But this generally applies to illustration jobs, I guess. When it comes to working on the game, we are all very hippie. We brainstorm together, we split the work if needed (e.g. coming up with new missions), and we discuss the problems that come up as well as their possible solutions. We usually agree on suggested changes before we actually make the changes. Of course, as deadlines approach my priorities slowly shift towards finishing illustrations, so I am usually less involved in finalising the rules. I hear there are easter eggs on both the [redacted] and Garden Party boards. What are your three favorite and why? Haha, oh yes, I like hiding bodies and out-of-place items here and there. The most obvious is probably the Weeping Angels in the basement. That is for all you Dr. Who fans out there. My favourite Dr. Who villains are the Daleks, but the Angels are easier to hide in the basement. 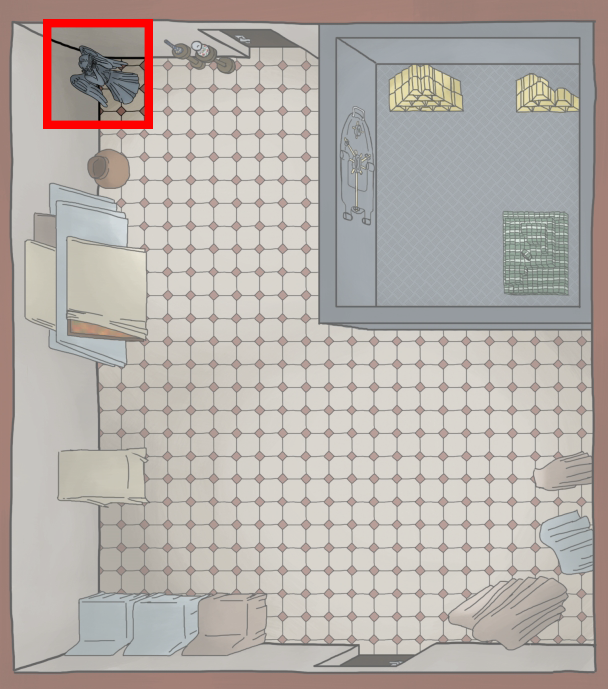 If you look closely at the Computer room, you will see that some people were playing [redacted] on the table some time ago. Fun fact: originally we wanted to call the game “intel” (well, originally it was “intelligence”, but to some people it sounded like a 90s trivia game), but we couldn’t go with the name for obvious copyright reasons. But the box art was already done with the name “intel” when news came that we couldn’t use the it. You can’t make out the letters on the board, but on that box on the table in the basement it says “intel”. Also, I used the actual board images for the boards on that same table. So there is the board in the board. It is a board-ception! 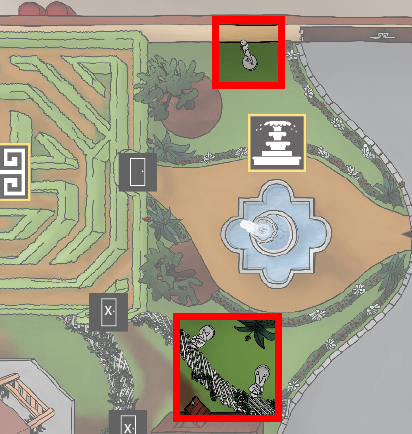 The three weapons that you can use in the game are actually in the embassy building. I’ll let you find them for yourselves. And finally, in the garden you will find us, the designers. The first four. Actually, I am almost finished with the fifth by now. When I started working on the garden, I got bored of my playlists pretty quick, so I had to look for other means of entertainment. Luckily, I have 2 monitors, and SG-1 popped up on my Netflix suggestions list. It occurred to me that though I probably have seen most of the episodes, I have never seen end to end. You see, the Hungarian TV channels pick up SG-1 time and again (usually during summer), but they tend to mix up the seasons so it can be hard to follow the story. I can’t pick a favourite. What is interesting though is that when I look at parts of the garden, they remind me of which episodes I was watching when I drew them. Teal’c went to Chulak when I made the hedge maze. They met the Tok’ra when I made the flowerbeds. They fought Hathor when I made the plants by the patio. Daniel Jackson was presumed dead when I made the fence, the pits in the garage, the other fence… yeah, he does that a lot. What advice would you offer someone trying to enter the gaming industry either as a designer or an illustrator? Never give up. It’s going to be hard to get the first deal. Some people will not like your game, but it doesn’t necessarily mean that it is bad, or that it cannot be fixed. What constitutes a perfect game day for you? Honestly, the best game day is playing board games with my boyfriend. And me winning, obviously. Our latest favourite is Imperial Assault. It occupied the kitchen table for a full week. Oh yes, and don’t forget good food and chocolate. That’s a must for any good game event. What are some positive characteristics of the gaming community? The people in this community are generally good people. They can get really competitive when it is about winning a game, and they get into ridiculous arguments about whether a game is good or not, but that’s because they are passionate. These games bring us together from all around the world. Doesn’t matter where we are from, or what language we speak, we get up at 6 on a Sunday to play BSG with people from the other side of the planet if that’s what it takes. What is a problem with the industry and how would you address it? Well, so far my experience with the industry involved the same bunch of people, so I don’t want to jump to conclusions about the industry in general. But one thing I’m sure about is that every first-time board game designer’s job would be easier if they had someone like David in their team. This guy just won’t shut up. Which is most likely the reason why we managed to get where we are now with [redacted]. I can imagine that there are lots of good game ideas out there which don’t get enough attention because their developers are not loud enough. How do you feel about Nutella? Do you have a favorite recipe? Love it! I can make a really nice Nutella milk shake. Well, it is more like vanilla ice cream mixed with Nutella… and when I feel particularly naughty, I blend a chocolate chip cookie in it too. Oooh… Killer!